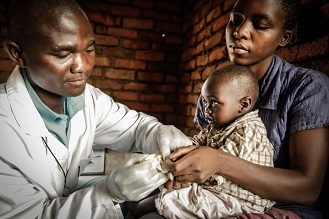 Barr Global approved a three-year grant of $1,500,000 to VillageReach to fund the training of at least 150 Pharmacy Assistants (PAs) for health facility deployment to improve pharmaceutical management in rural Malawi. This report provides an update on the progress made during the third year of the three-year grant (from August 2015 to January 2016). 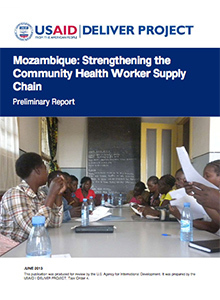 This report provides findings and recommendations from a study examining the health logistics capacity and performance of 53 districts in Mozambique. 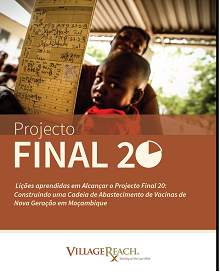 The study analyzes quantitative and qualitative evidence obtained through surveys with 114 Pharmacy, PAV (Expanded Programme on Immunization), and Management personnel in health facilities/medicine stores in all health districts across four provinces: Maputo, Gaza, Niassa, and Cabo Delgado. 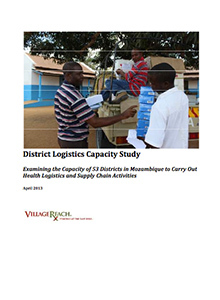 This survey sample represents just under 40% of all districts in Mozambique’s health system. 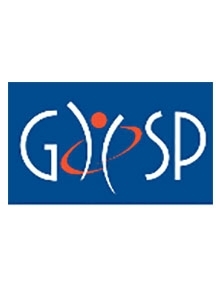 Program updates for the three-year Pharmacy & Supply Chain Strengthening Program to improve access to essential medicines. can treat more patients and improve service quality. The evidence base to support the growing field of mHealth is relatively nascent, with most studies lacking the level of rigor needed to inform scale up of interventions. This paper investigates the impact of a maternal, newborn and child health (MNCH) mHealth project in Malawi, comparing the intention-to-treat (ITT) and the treatment on the treated (TOT) estimates, and discussing the implications for future evaluations. Services offered included a toll-free case management hotline and mobile messaging service for women and children. The evaluation methods included a quasi-experimental pre-test post-test design, consisting of cross-sectional household surveys. A total of 4,230 women were interviewed in the intervention area and 2,463 in the control site. While the intervention did not have any ITT effects of the MNCH outcomes studied, there were large TOT effects. Rigorous evaluation designs can be successfully applied to mHealth pilot projects, helping to understand what works and what does not. Journal Abstract: The crisis in human resources for health in low-income countries has been documented many times over by research and experience. 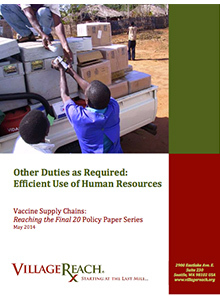 A fundamental issue in human resources in the vaccine supply chain is the system in which the health worker is working, which requires more than training and revised guidelines to address. 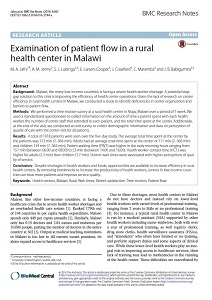 Global Health: Science and Practice – SMS versus voice messaging to deliver MNCH communication in rural Malawi: assessment of delivery success and user experience. Read the full article published in Global Health: Science and Progress. 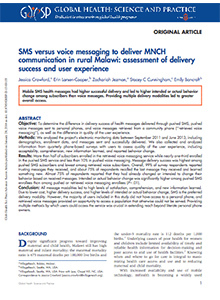 SMS versus voice messaging to deliver MNCH communication in rural Malawi: assessment of delivery success and user experience. Read the full article published in Global Health: Science and Progress..
UW, VillageReach, John Snow, Inc. 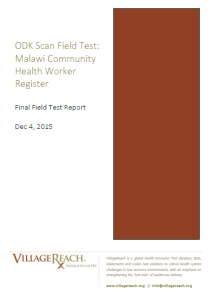 This paper describes our experiences integrating ODK Scan into the community health worker (CHW) supply chain in Mozambique. ODK Scan is a mobile application that uses computer vision techniques to digitize data from paper forms. This is the summary of our work in the Supply Chain category on the VillageReach web site – under the “OUR WORK” section. Robert Phiri is part of the first class of graduates from the Pharmacy Assistant Training Program in Malawi, the result of a collaboration between the Malawi Ministry of Health, the U.S. Government through the USAID | Deliver Project, the Malawi College of Health Sciences, University of Washington Global Medicines Program, and Seattle-based NGO VillageReach. 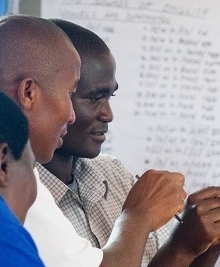 The program produces a dedicated cadre of individuals with enhanced training in medicines management and supply chain practices with a plan to eventually support each of Malawi’s 650 rural health centers. 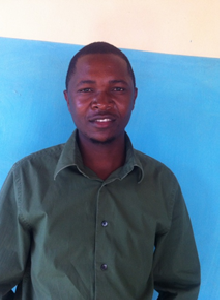 Robert graduated in June 2015 and was placed at Lidzulu Health Center in Ntcheu District in June 2015 which serves a population of 45,000. I enrolled into this program because I have a heart to serve the people, especially those in rural areas mainly in the health sector. 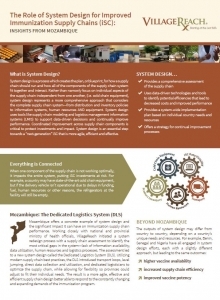 This infographic shows the benefits and differences between a multi-tiered supply chain system and a streamlined approach based on VillageReach design, implementation and results of the Dedicated Logistics System in Mozambique, delivering a 17% cost savings and increased efficiencies across the supply chain. Interview with: Emilia Albino Chilaule, Técnica de Medicina Preventiva, Centro de Saúde de Alto Changane, Distrito de Chibuto – A health worker who works in a health center served by the DLS. The Pharmacy Assistant Training Program in Malawi is contributing to a robust pharmaceutical workforce through the introduction of a two-year certificate-level training program focused on improving medicines management and pharmaceutical practice at the health center level. Click this link to see the full overview of this project via the IMPACT section of VillageReach web site. 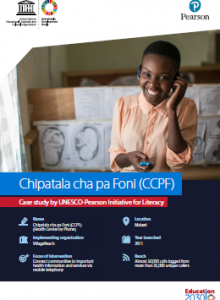 Chipatala cha pa Foni (CCPF), or Health Center by Phone, is an mHealth innovation in Malawi designed to increase access to timely and appropriate maternal, neonatal and child health information, advice and care. This is the overview page on this web site that outlines our experience and capabilities around Human Resources for Health. Press Release: New Pharmacy Assistants Graduate in Malawi, Improving Patient Care at Critically Understaffed Rural Health Centers> Malawi College of Health Sciences, VillageReach, University of Washington and the Malawi Ministry of Health Collaborate on an Innovative Program. Since 2008, VillageReach has led a program to increase the reach of health services at the community and health center levels by building capacity of community health workers, implementing cost-effective interventions to reduce malaria and diarrheal diseases in children under 5, and improving maternal and neonatal health through community-based interventions. 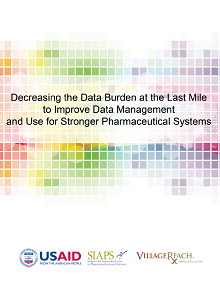 SIAPS is a USAID-funded program to improve access to pharmaceuticals. VillageReach’s role is to support Management Sciences for Health in an ongoing development effort to make the case for decreasing the burden of pharmaceutical and supply chain data collection in frontline health workers and increasing the focus on the key data points needed for decision-making. 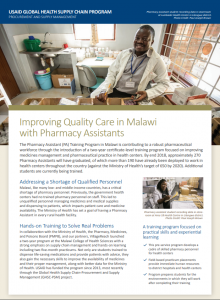 The Pharmacy Assistant (PA) Training Program in Malawi is contributing to a robust pharmaceutical workforce through the introduction of a two-year certificate-level training program focused on improving medicines management and pharmaceutical practice in health centers. 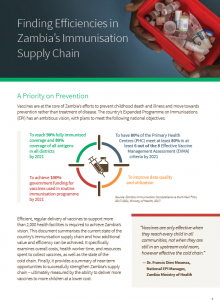 Vaccines are at the core of Zambia’s efforts to prevent childhood death and illness and move towards prevention rather than treatment of disease. 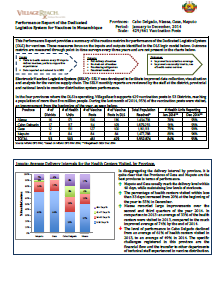 This piece provides an overview of Zambia’s Immunisation Supply Chain and the results of a recent modelling exercise. 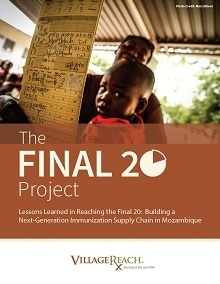 This overview document provides a brief overview and explanation of system design, and how those principals have been applied in Mozambique with corresponding evidence of impact including significant increases in fully vaccinated children, reduced stockouts, improved cold chain uptime and other efficiencies, all at a reduction in government operating costs. 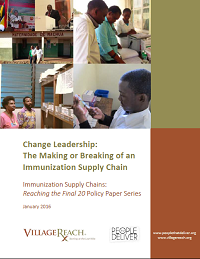 This report provides a comprehensive overview of VillageReach’s immunization supply chain strengthening work under the Final 20 Project, included lessons learned and other insights for countries looking to move to an updated or “next generation” immunization supply chain. times between paper and digital materials. Guided by a vision for a vibrant, just, and sustainable world with hopeful futures for children, Barr Foundation engaged with over 20 organizations striving to improve the lives of children and families living in poverty in East Africa,India, and Haiti. 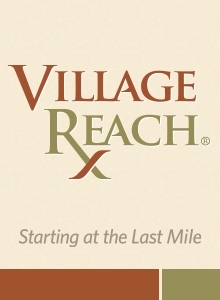 Read an exerpt from the report here featuring a progress report on VillageReach Pharmacy Assitants Program, generously funded by Barr Foundation. The Last Mile Supply Chain (LMSC) program recently began its operations in Zambézia province and the initial results are favourable. Through a private logistics provider working closely with DPS Zambézia, products were delivered to 57 health facilities in the districts of Mocuba, Milange and Quelimane in December 2018. José Maria, Helena José Virgílio e Pedro Terezanane representam centenas de heróis que, diariamente, faça chuva ou sol, faça frio ou calor, garantem a disponibilidade de medicamentos e outros artigos médicos nas unidades sanitárias. Como resultado milhões de pacientes em todo o país têm acesso aos medicamentos que necessitam para o seu tratamento em tempo útil. Nos primeiros meses da implementação do Programa Cadeia de Abastecimento até à Unidade Sanitária (LMSC) na província da Zambézia, os resultados são satisfatórios. Só em Dezembro de 2018, 57 unidades sanitárias nos distritos de Mocuba, Milange e Quelimane receberam os medicamentos através de um provedor de serviços de logística privado, em colaboração com a Direcção Provincial da Zambézia. Helena José Virgílio é Assistente Administrativa no Depósito Distrital de Medicamentos de Mocuba, José Maria é Fiel de Armazém no mesmo distrito, e Pedro Terezanane é o responsável do Depósito Distrital de Medicamentos em Milange. Estes partilham os mesmos desafios e as mesmas expectativas em relação à introdução do sistema de distribuição terceirizada de medicamentos, através do programa LMSC. “Bending the Arc” tells the story of health workers who showed up every day to make sure their TB or HIV patients took their medicines, had food to keep them strong during treatment, and had the social support needed to get through years of treatment. Partners in Health hired and empowered community health workers (“accompagnateurs”) to reach patients directly, as a contrast to the westernized model of patients needing to reach health care facilities. Then the organization used its influence to bring the evidence of this success to policymakers, global gatekeepers, regulators, and financing institutions and break down pervasive barriers to equitable and affordable health care. Malawi, like many low-income countries, faces a severe shortage of health workers. In a country of more than 16 million people, there are only 302 doctors – that’s more than 50,000 people for every one doctor. Because of these shortages, most health centers in Malawi rely on lower-level health workers to provide services. These workers share responsibilities far beyond patient care, so it important to find new, low-resource ways to support them in providing the highest quality service possible. We are pleased to announce that the Johnson & Johnson Foundation has become one of the key partners in championing Chipitala Cha Pa Foni (CCPF) as it advances towards national scale. The Johnson & Johnson Corporate Contributions is a known supporter of community-based health care solutions that strengthen the health workforce, save and improve the lives of women and children and prevent disease among the most vulnerable. A blog describing VillageReach work with AMP in Benin to implement OpenLMIS. In Benin, OpenLMIS collects critical supply chain data at the “last mile” of healthcare, where data visibility and accuracy is most important, providing a solid evidence base to inform decision makers on future national policies and support the data needs of Logivac+, an informed push distribution system for immunization commodities. In response to this article by Dr. Mahad Ibrahim on the role of data during the Ebola outbreak, some interesting questions were sparked among our team. The piece evoked a lot of great insights about the opportunities and challenges the piece addresses, as well as how we see those topics evidenced in our VillageReach work. 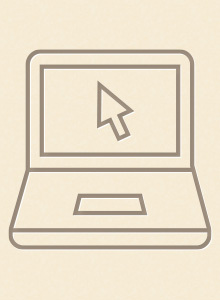 This topic is of particular interest to us, as we and our partners at the University of Washington are actively developing and testing an open-source tool for paper to digital data conversion, ODK Scan. ODK Scan is an Android app that uses a smartphone’s camera and custom image recognition processing to automatically digitize information from paper forms. Our work with ODK Scan and our experience with digital tools in other programs has informed much of our understanding of this paper to digital question. Below are some general themes that regularly surface in our discussions, plus some specific examples from our experience. Today the world recognizes World Aids Day – a day to unite in the fight against HIV and to support the millions of people around the globe living with HIV. A blog about the expansion of OpenLMIS (SELV) in Mozambique and our expanding role in advocating for better data visibility and analytics as a key component of vaccine supply chain improvement. Blog from VillageReach Community Health Faciliator in Malawi, explaining the critical role of VillageReach-supported Health Surveilance Assistants and village clinics. Through our daily interactions with health workers and government partners, I’ve seen first-hand the challenges to achieving immunization equity, especially as new vaccines are being added to already strained systems. How can smartphone apps improve health assessments in rural villages? This is precisely what VillageReach, in partnership with D-tree, is figuring out. During the first week of February 2015, 25 health surveillance assistants (HSAs), nurses and other health workers received intensive training on smartphone technology and the capabilities of a new maternal and neonatal health (MNH) assessment application designed by D-tree. 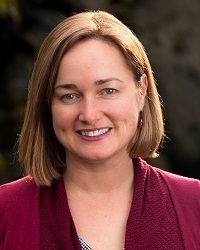 Blog by Melissa Sanchez, VillageReach. While technology has become more and more common in addressing issues of health care in low resource communities, the most effective solutions are usually the most accessible and inexpensive, and ColdTrace is an example of such a technology. Had it not been for CCPF and the transport officer, Mercy would have suffered severe bleeding and infection. Fortunately, she and her baby boy received timely and appropriate care, and both are happy and healthy today.